The Spanish manufacturer is producing photovoltaic modules for important social projects in Latin America. A new project of great social value is going to be carried out in Peru using photovoltaic modules made by Zytech Solar, a Spanish company that continues consolidating their commercial presence in all of Latin America.. On this occasion, they have been awarded three Home Photovoltaic System projects (SFVD), which will supply electricity to over 3000 homes in remote regions of the country. A consortium comprised of Enerquímica and Q-Energy Perú is managing the projects. The aim of this rural electrification project is to provide electricity (at 12V dc) to isolated homes in the Piura and Cusco Departments. Each home will be supplied electricity through a system comprising a 65 Wp photovoltaic module, a 90 Ah battery, 3 lighting points and an electrical socket. 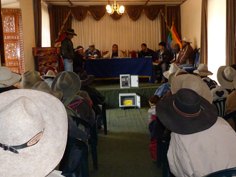 At a total cost of over 2.8 million dollars, the three projects involve systems destined for homes in the Frias district of the Piura Department, as well as the Livitaca district of the Cusco Department, and the Calca, Paucartambo and Chumbivilcas provinces. Identical systems will be deployed in mountainous and highland jungle regions of the country, areas where there are still some population centres without access to the grid. 808 Zytech Solar ZT65S (52kW) modules will be used in the first project in Piura Department, 2004 ZT65S (130kW) modules will be used in the second project in Cusco Department, and 589 ZT65S (38kW) modules will be used in the third project, also in Cusco. The total budget for the projects comes to over 2.8 million dollars and has been funded by the Ministry of Energy and Mines of Peru, the General Directorate of Rural Electrification (DGER) and the Directorate of Competitive Funds (DFC), administered through the Electronoreste and Electro Sur Este electricity supply companies. A significant improvement in living conditions. These simple installations will bring light, and enough electricity to power a radio or a small television, to families in homes without access to the grid. This will lead to significant improvements in living conditions in every home in which these systems are installed, given that the residents will be able to enjoy electric light and use small household appliances. For the Spanish company, which has its corporate headquarters in Zaragoza, this type of project brings great satisfaction because while photovoltaic solar energy in developed countries is an environmentally sound contribution and a safe and profitable investment, in developing countries – with many people not being able to access the grid – it is the only reasonable option for obtaining power. “The ability to perform activities we take for granted, such as reading, studying, listening to the radio or watching television makes a substantial difference in the lives of these people, who until now have not had access to electricity”, said Enrique Zueco, president and founder of Zytech. Rural electrification in Bolivia and Ecuador. Zytech Solar has supplied modules for similar projects prior to this rural electrification project. Last year, for example, 55kW isolated kits using Zytech monocrystalline modules were installed in Tarija (Bolivia), which provided families with a basic service. Zytech modules have also been used in isolated communication systems in high mountainous areas by the Ecuadorian army. The installations have been used at transmission stations for army’s communication network. These photovoltaic modules and the associated materials have to stand up to harsh climatic conditions, meaning that the robust nature of the modules is essential to ensure the installation is resilient and functions correctly. Consolidation and expansion in the Latin American market. Zytech Solar continues to expand its international presence and take a firm hold in those markets it has penetrated in recent years. Such is the case with the great Latin American market, where the Spanish company continues to grow both in ever increasing market presence and sales value. Within its Latin American consolidation strategy, Zytech has sales representation in Mexico and has recently opened a new office in Chile with a specialized marketing team.